Hello everyone, apparently I'm not getting better at blogging more frequently but I will keep trying! Since I last wrote we've been to Chuy (by accident) florianopolis and foz d'iguacu. Chuy is the only place in the world where even the lonely planet guide couldn't find anything nice to say, and just advises you to turn around as you must be lost! We were trying to get a bus to florianopolis and idiot Sarah told us we had to go to Chuy and change buses. However when we got there we were told there weren't any buses. Luckily at this point we had met the first of the nice swedes, three boys who had similar feelings for Sarah, to help make light of the situation. we found a hostel to protect us from the many rabid dogs and our hostel owner helped us to leave the next day! Eventually we arrived in florianopolis! It is the most beautiful place and definitely a top holiday destination with fabulous beaches and plenty to do. The waterfall at costa de Lagoa is lovely to swim in and the boat tide there is also stunning (probably better when Gareth isnt making small children cry). Campeche island has yet another incredible beach and some lovely walks. Don't go there on a windy day if you don't want to be buried in sand and don't drink soft drinks there unless you enjoy swarms of wasps in your face! Galhetta beach, equally as amazing as the others although it is a nudist beach, and no they won't tell you until you get there. Deciding to save the two reals it costs to take the bus and walking to the beach across the sand dunes... Ninety minutes later and I knew how tom hanks felt in the film castaway, Wilson and all. Having been in south America for two weeks and having our next Swedish friend ask Gareth of it was his first day in the sun due to his outrageous burn. Next it was on to iguacu falls! 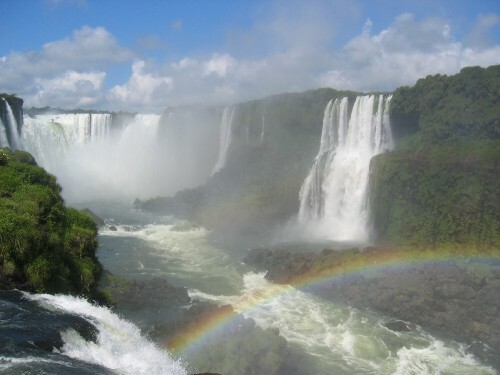 The waterfalls are amazing and can be visited from both the Brazilian side (great for an overview of all the falls) and the Argentinian side (getting up close and wet). Doing everything with Anna, who was horribly afraid of heights and all to ready to put Gareth into his place so, naturally, was my favourite person to date. The boat ride on the argentinian side literally soaking you under the falls, much needed on a hot day. The falls themselves, just amazing. Our meal at a churrascaria with a show of all south American dancing. Being attacked by raccoons for anna's lunch. Having to run through the park to get our bus home, the hottest place we've been yet and not designed to be taken in a rush. The locals were infinitely more amused by our panic than we were. Having a sore throat from entertaining the bus driver with our best lion king singing... Apparently not such a good way to amuse the locals. Sorry I have been rubbish at updating, will keep trying and hopefully by the time I come home I should be doing it once a week! Freddie (Idiot Brother) Update this more often you fool!!! anyways sounds like your having a whale of a time, and im very jealous indeed! they keep on teasing us here by predicting snow and then just giving us copious amounts of rain! very unimpressed... sounds like there's alot of water-based activites going down, very refreshing. hope your having as much fun as you sound like you are, and dont forget to keep blogging!!! fb if you want a chat you know where i am!